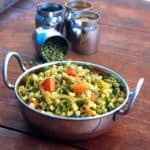 Easy, wholesome, and fresh, this sprouted moong salad or mung salad uses a few simple Indian spices like turmeric and cumin for maximum flavor. Soy-free, gluten-free and nut-free. Add the onions and a pinch of salt. Saute until the onions start to turn golden-brown. Add the garlic and green chillies and saute for a few seconds. Add the tomatoes, turmeric, garam masala, coriander and cumin powders and cook until the tomato starts to break down but isn't quite mushy. Add the sprouted mung beans and mix well. Cover and let the beans cook over medium-low heat for about 15 minutes. Stir every once in a while and, if needed, add a couple of tablespoons of water to prevent sticking. You can let the beans cook longer if you want them to be softer. I like mine a little al dente with some crunch to them. Add salt to taste, sugar and the lemon juice. Mix in the coriander leaves.